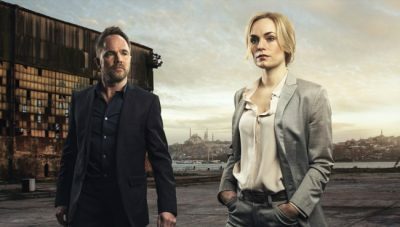 Norwegian Broadcasting (NRK) was topping all its morning newscasts on Tuesday with reports of how its television drama Mammon 2 won Norway’s first Emmy Award for best international drama series during the night. The coveted Emmy was described as “historic,” and a new milestone for Norwegian television production. “This is so much fun, completly wild!” exclaimed Vegard Stenberg Eriksen, who created the series along with his brother Gjermund for NRK. The Eriksens, who come from the small town of Mysen southeast of Oslo, were in New York to receive the award at the Emmys on Tuesday night. The series’ second season was up against tough competition from other drama series produced in Australia, Brazil and Japan. The Eriksens had told NRK before the Emmy Awards began that they liked all their competitors and actually thought the Japanese series Moriribito: Guardian of the Spirit would win. They were thus surprised and very happy when the series they had written and helped produce won instead. The international Emmys are awarded in 11 categories, and a Norwegian actress, Anneke von der Lippe, won the prize for best actress in 2015, for her role as a police investigator in another NRK series, Øyevitne (Eyewitness). Mammon 2’s award, though, is the first for an entire series. Its first season aired on NRK in 2014, and rights to the series have been sold to several countries that have produced or plan to produce their own versions of the series.